"History is the essence of innumerable biographies"
Marriage, if made of love and honor, unites two souls in a lifetime of cherished memories and in a collection of important moments shared with family and friends. Not too long ago such a union of souls existed. One full of such love and such honor that it sprouted wings and flew into the pages of Japanese-American History. From the memory of a loving granddaughter and the honored hearts of those that retell their story, here is the story of Yoneguma and Kiyoka Takahashi and how their carved birds became "American Treasures". Yoneguma and Kiyoka Takahashi were married in 1938, both 1st generation "Kibei Nisei" Japanese-Americans. Yoneguma's parents arrived in America in the early 1900's with intentions of making and living the "American Dream". Kiyoka's Parents arrived in America also in the early 1900's but spent most of their marriage apart from each other. Kiyoka's father worked as a cook in the United States to support his family in Japan until 1937. In 1937 Kiyoka returned to the United States as a "Picture Bride". Yoneguma was 17 years old when he returned to the United States. He was a hard working young man, and after meeting his beloved wife Kiyoka, supported his new family by working in the produce industry, operating a stand near Knott's Berry Farm in Buena Park, California. Both were educated. Because Yoneguma studied in the U.S. and Japan, he was able to read and write fluently in both Japanese and English. His education in the US and Japan was interrupted, therefore he was unable to utilize his education for advancement. Kiyoka, who at the age of three left with her mother to Japan, studied art in High School and College. Her education would one day contribute, along with the patient and diligent hands of her husband, to creating a successful business that would support her family. During the early years of Yoneguma and Kiyoka's marriage they lived within the bonds of an America that still, at its roots, was a new and growing country. Consisting of many different cultures America was a mosaic in progress with many individuals working to create a bigger and better future for the coming generations. Though the dream was pure the times were difficult. Many people, Americans, treated each other without respect, without understanding and without justice. Fear and ignorance showed its face in the society at large on many occasions and during WWII reared it's head in the direction of the Japanese-American population. After the bombings of Pearl Harbor our government forced some of its citizens into what they called Internment Camps. With only a few days notice Americans were forced to sell their belongings for very little, ripped from their homes and stripped of their constitutional rights. Among these Americans were Yoneguma and Kiyoka Takahashi and their three young sons, Joe, Tom and Jim. They were taken from Buena Park to Poston Camp in Arizona. In the blink of an eye five American lives were changed forever. The Takahashi boys remember being registered and given numbered tags to identify themselves and their belongings. They were shipped like cattle on overcrowded buses. The Takahashi parents remember the notice "bring only what you can carry". Many years after her experience Kiyoka shared with her oldest granddaughter Carol Takahashi "...I carried proudly my most precious possessions, my baby boys and family pictures." In the camp they all tried their best to continue with their lives. Yoneguma and Kiyoka along with others in the camp did their best to make the transition easier on the children by making schools, gardens, auditoriums and the like. For the parents and older citizens it was all they could do to keep their minds off of their terrible situation. In many of the camps across the country the "campers" participated in crafts to pass the time. 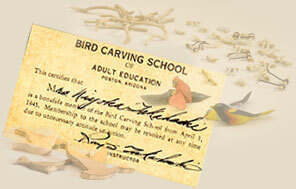 In Poston Camp, Arizona, one of the crafts that the "campers" learned was to carve various birds out of wood. Resources were limited but resourcefulness was not. They collected the wood from old egg carts and bits of wire, to create little legs, clipped from their window screens. They made the knives they carved with from old hacksaw blades. They also painted the birds using watercolors or any other paint they could find. Inspiration and source material was found in the pages of old National Geographic's, Audubon Society books and the natural environment around them. Some citizens mounted their birds on twigs, desert sagebrush, found around the camp. Some would mount safety pins on the backs of the birds to create a lapel pin or broche. These little treasures were given away as gifts as well as sold and kept as a reminder of their incarceration. Each bird representing a quiet lesson in tolerance and freedom, poignant relics of their wartime experience in the United States Concentration Camps. Yoneguma and Kiyoka took part in the craft classes that taught the creation of the little wooden birds and in turn the classes became a part of their future and their "American Dream". Yoneguma, Kiyoka and their boys were interned for 3 1/2 years. When they were released in 1944 they settled in Garden Grove, California to try to rebuild their uprooted lives in a less than friendly environment, starting with nothing. But their spirits were unbreakable and the couple began to turn the craft they learned in the camp, of carving and painting little birds, into a business that would sustain their family and help them to purchase their first home. Yoneguma traded-in his produce industry experience and became a carver of historical keepsakes. They kept their workshop and storefront in their home and created a mom and pop business that would span the rest of their lives together. The interest in their birds grew every year. Their only advertisement word of mouth and the word spread like eagles' wings over the Western United States. The bird pins and earrings were sold individually as well as purchased by stores from Chicago to San Francisco. Some of the stores included, Ambercrombie & Fitch Co. and Gumps Department store. The demand for "Takahashi" hand carved, hand painted birds was overwhelming. It was just the two of them carving and painting the delicate lapel pins. The intricate skill needed to create the birds made it impossible for them to train or hire anyone to help with the workload. The only assistance they received was from their sons to whom they would pay a penny for each bird leg they helped to make. No one could ever truly take over their business, their art. Yoneguma and Kiyoka's life experience contributed to their belief in the value of an education. They always impressed upon their boys and grandchildren that pursuing and completing their educations was of the utmost importance. For Yoneguma and Kiyoka working hard was a means to an end, to create a better life for their children. In life no one truly escapes work but if you can find what it is that you love to do and then have the means to pursue it fully, through education, it makes life easier and more fulfilling. 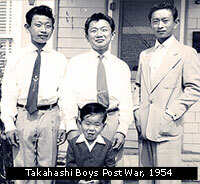 The Takahashi family endured many hardships and even so do not harbor any animosity towards the United States for how their family was treated. They were able to transcend the treatment they received and to look on the bright side of their situation. Also, they learned the craft that allowed them to achieve their "American Dream" in the Japanese-American Internment Camp in Poston, Arizona. Their cage became their teacher. One can only hope that if forced to relinquish freedom without explanation or cause one would raise to the level of understanding and forgiveness displayed by the Takahashi Family. The Takahashi's ended the production of their Bird Pins when beloved wife and mother Kiyoka fell ill with Lou Gehrig's Disease. A friend and patron of the Takahashi lapel pins recalls, " It was so difficult to see the hands that were capable of such delicate work unable to open a door." Kiyoka passed away April 15, 1994 at 1:30 pm. Yoneguma Takahashi lived for another 10 years after his wife passed. Yoneguma, master craftsman, passed away Tuesday July 13, 2004 at the age of 95. They are survived by a flourishing family. Though the Takahashi Birds are no longer in production what they represent will live in the hearts and minds of all Americans. And with hindsight as our guide may we never allow any of our neighbors to endure such injustice ever again. Though the craft of carving birds was practiced in many of the Japanese-American Internment Camps and many people participated in the craft, none created the birds as prolifically or as beautifully as Yoneguma and Kiyoka Takahashi. In September 1999 150 Takahashi Bird Pins were given a place in the permanent collection of the Japanese American National Museum in Little Tokyo by one of the Takahashi's patrons, Mr. and Mrs. Erickson. You can visit the museum today to view many of the bird pins and read more about the Takahashi family. It is a fitting tribute to the Takahashi's and their craft that they are forever sewn into the fabric of history. Serving honorably, as a reminder, to us, and the generations to come.